It is Halloween, and it is flooding. Hence, there is plenty of time to blog, as opposed to constructing my Halloween costume that is sure to get ruined in the torrential downpour predicted for this evening. 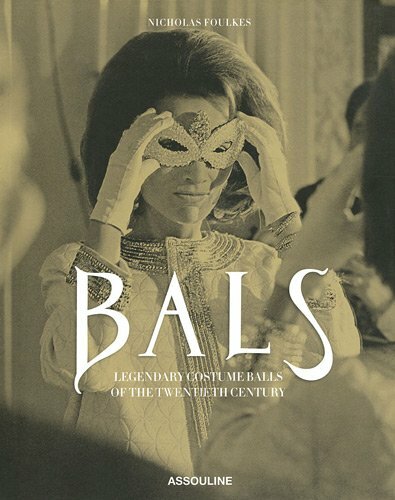 I’ve dispersed some of my favorite costume images throughout this blog from my lovely cocktail table book, “Bals”. Costuming has been around longer than Halloween, originally related to ritual and religion, it has been around since the beginning of time. Halloween has its’ origins 2,000 years ago in Celtic Europe. The Celtic New Year was called Samhain and Halloween was the night before, Samhain eve. On Samhain eve, spirits were traversing the earth on their journey to the afterlife. The Celts would wear costumes to confuse the spirits and avoid possessions. They would frequently cross-dress or dress like ancestors long dead in order to have the upper hand over the travelling spirits. I am relieved that nowadays costuming is more fun and festive than trying to save your soul from possession. It is an opportunity for an individual to try on a new hat, step into the shoes of a new person, and let down their inhibitions with the perfect excuse: “I’m not myself tonight.” There is always excitement and revelry at a costume party, with guests all trying to outshine one another. There is certain joy in inventing and making one’s own costume, complete with makeup and hair. I have many friends who have said that getting ready for the costumed event was much more fun than the event itself. Hours primping in front of the mirror, gluing on false eyelashes while dancing- a challenge if there ever was one. In years past, a trend started in which women would use the excuse to dress super promiscuous for the evening, with no need for an excuse- it’s a costume! In fact, it was almost a given that you would see more of your friends’ flesh than ever before. Events such as “saints and sinners” and “Angels and devils” became very popular… and who can forget my friend Adam’s annual “ho, ho, ho!” charity party where everyone dressed like a (you guessed it) “Ho”… except for the year that adam got engaged and at his fiance’s request took the “ho” out of the Christmas party.. Funny, no one sent me the memo and I was the only one in costume that fateful night. In recent years, there has been a new trend, though. As opposed to wanting to have the sexiest costume, individuals want to have the wittiest costume at a party, poking fun at current events or internet memes. I expect to see a grumpy cat or two tonight, albeit a soaking wet grumpy cat. And now I must go fish my cat woman headpiece from storage for my costume themed barre class. No lie.